We loved all the rain last week, and we are pretty sure we have never seen the fields here look so lush and green. In the last month, the production at our farm has doubled from the month of May in 2017 with the same number of hours from our crew. ~This seems like nothing short of a miracle and...it is!~ The soil, the good earth, purposeful work, feeding a community--these things are Truly Miraculous. It has also been the result of an unsustainable workload for Jay and me. We are working to fix that this week and bring in a few new crew members. If you would like a three hour Peek Into Farm Life this week only (and we know this is late notice but...The Time Is Now) you can come work on the farm for three hours in exchange for a $25 gift certificate--any three hour stretch between 8 am and 6 pm Monday through Friday. 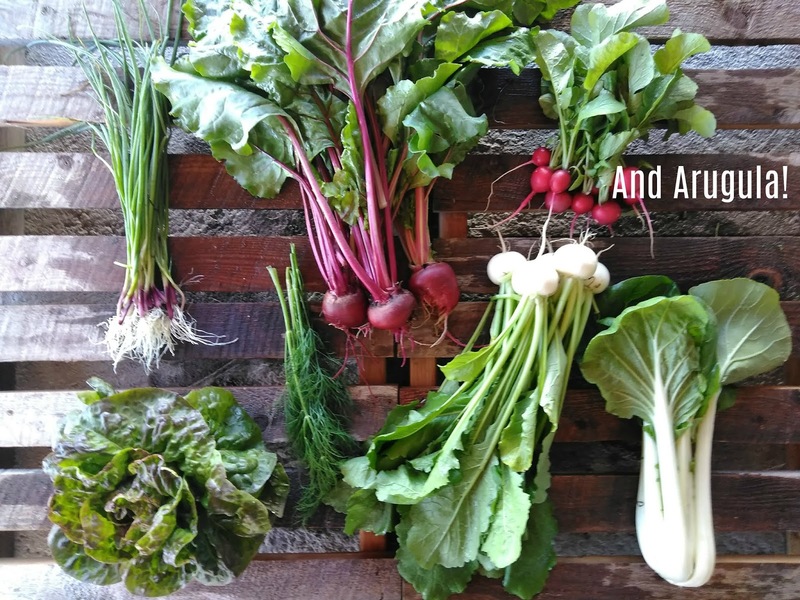 It’s not a volunteer opportunity, but a chance to work with our crew in trade for veggies. Unfortunately, we don’t have work for children and youth under the age of 15, so you would have to make other arrangements for them. During this busy season, we employ a full-time childcare provider to watch our own kids to help ensure that they keep all their fingers and toes into adulthood. Let us know your availability, and we will have work for you! This week we have many jobs available, including tying up tomatoes and cucumbers; basket-weave-trellising peas, tomatillos and tomatoes; weeding the first planting of carrots; doing (hopefully!) the only weeding on the garlic; washing bundles of roots and washing out harvest tubs. For those who can’t work on their feet we have the (seemingly endless job!) of putting stickers on our retail bags of baby greens. On the other end of the spectrum, if you love heavy work--some of us do!--we have some work this week that requires heavy lifting...let us know...we would love a hand hauling sandbags and pulling tarps. All work will be very well supervised and explained by Jay and me and the crew; no experience necessary. 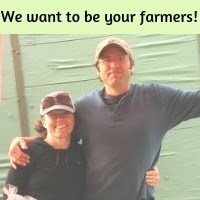 Send us an email at info.lowervalleyfarm@gmail.com if you are interested, and we will get you on our schedule! Again, this week only, because next week we will (fingers crossed) have some new crew members. Radishes- We weren’t going to put radishes in the shares this week...and then...this week’s planting of radishes just might be the best we’ve ever grown...how can we not put them in the shares?! Hakurei “Salad” Turnips- these are a delightful spring turnip that are similar to a radish and just delicious thinly chopped and eaten raw. Also *greens alert* this is my favorite braising green! Beets- You know what sounds good to me right now? A Beet Green Tart. That sounds like a lot of work...I’ll probably make a beet green frittata. Butterhead Lettuce-I like to core these and wash the leaves and keep the leaves whole in a bowl in the fridge. Perfect for topping any sandwich or burger. Also great way to eat lamb roast and guacamole on those crunchy little lettuce boats. Dill-We had quite a few recipes for dill in week 1 and 3. Also good of course with any fabulous rich dairy product like cream cheese or sour cream...and for those not wanting something quite so rich it’s also great mixed into plain greek yogurt; throw in some green onions too...wait...that would be good on top of that beet tart/frittata. Bok Choi--Delicious in a stir-fry, of course, or see the Recipe of the Week for a new idea. 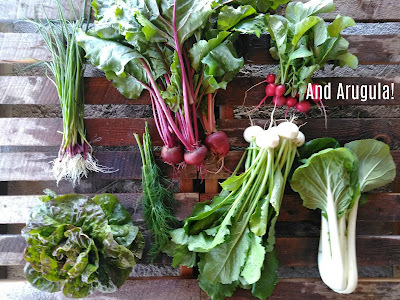 This week, with these veggies, I’ll be roasting the beets to save time later. While they roast, I’ll saute the beet greens and keep them in the fridge for a quick frittata (a.k.a imaginary tart). Also, I happen to know from personal experience that sauteed beet greens and sausage are pretty darn good on top of a frozen pizza. I’ll also be mixing the dill and green onions into a fabulous dairy product to top things with. Slicing the radishes and hakurei turnips to have ready to top raw on salads and stir fries and sauteing the bok choi, turnip greens, and radish tops for a stir fry or two. This also marks the first week of getting out a CSA box and making sure the full share fits in the box after taking the photo. :) It fits, but barely! Put washed whole potatoes, with skins, in a pot; cover with cold water, add some salt, bring to a boil, then turn down heat to medium and cover/boil 15 - 18 minutes or so, until they pierce easily with a sharp knife. While potatoes are boiling, chop bok choi leaves AND stems into small dice. Dice the radishes up small (1/8th inch-ish or less). Combine vinegar, garlic, salt, sugar or honey, olive oil, and dill; whisk together. When cooked potatoes are cool enough to handle, slice as carefully as you can and then dice the slices. Toss warm diced potatoes into a bowl with bok choi and radishes; re-whisk the dressing and pour over the warm potatoes and veggies. Stir well to mix, then refrigerate until completely cooled.